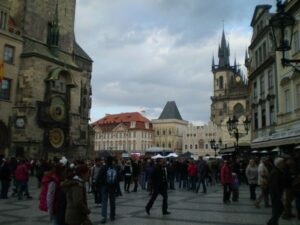 Nowadays English teachers in the Czech republic are primarily coming from US, UK, Canada, Ireland, Australia, and New Zealand. In this article, I will give you an overview on different kinds of work visas and a few tips to help you be better prepared for the local job market. It is possible to work as an EFL teacher on a contract, but prospect employers need to advertise the position for at least one month, and register this vacancy within the Czech “Jobseeker’s Office”. Once the month is over and no Czech or EU citizen are found suitable for the position, the “Jobseeker’s Office” may issue a permission to hire a foreign teacher, with which you can apply for a work permit and use this permit to obtain a work visa. Realistically, you are more likely to land a job as a freelancer, on a trade license, or as they call it here, a “živnostenský list.” The vast majority of offers (and there are plenty in the market) are for freelancers. This means that you will act as a services provider, usually for a school, without any of the rights you would have with a contract; paid holidays (4 weeks) and sick days, and paid health insurance. In all likelihood your pay will be much higher, however, and you will have the flexibility to work for different schools and have private students. The better teacher you are, the more business you’ll have. If you opt for the “zivno,” and I believe this is the best way, please gather the following documents before applying: proof of funds , passport, proof of accommodation and 2 photographs. Once you get your visa, you will have to come to the Czech republic and go to a “Živnostenský úřad” (Trade License Office) , bringing your criminal background check, visa, 1,000 CZK, and a CRM form. If you are a Canadian teacher, all your documents will have to be submitted either to the Embassy of the Czech Republic in Ottawa, or the Consulate General of the Czech Republic in Toronto. As a rule, the application must be submitted in person, but there are exceptions; also bear in mind that many schools will offer visa services and provide all the assistance you need. On a last tip: some schools will try to give you an employee contract while at the same time requiring you to work on a trade license. This is illegal, but common practice, and subjected to heavy fines for both the employer and employee. This “švarcsystém” is convenient for the employers in that they don’t have to pay taxes and your holidays, for instance, and they may fire you at will; by the same token, it is unfavourable for you since you will be bound to a contract and its regulations while in all actuality having the same working conditions as a freelancer. Be aware of it and I’m sure you will enjoy working and living in this breathtaking cosmopolitan city called Prague.